As I sat in a tippy wooden dory deep in the Amazon rainforest—dripping wet with sweat, DEET, and the remnants of a sudden afternoon shower—I couldn’t help but wonder about the wisdom of my decision to spend an afternoon fishing. Specifically, fishing for piranha. In theory, catching these little terrors of fresh water doesn’t take a lot of skill. It’s pretty basic: raw beef and a hook. To get their attention, you flail your pole around on the surface of the water and then let the bait sink, as if some living thing had just croaked. 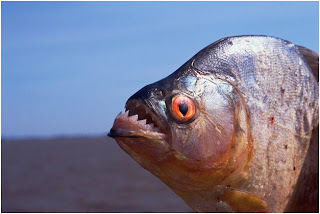 While piranha have the capacity to tag team a live cow and munch it to the bone in a matter of minutes much like a teenage boy who skipped lunch, they’ll only go there if they are trapped and really, really hungry. They prefer snacking on dead stuff that won’t fight back. So that’s where cubes of Brazilian steak come in handy. Lots and lots of cubes. See, I quickly discovered these little buggers are both sneaky and fast. Pretty much as soon as I’d feel a tug and yank up the line, I was left with a freshly de-meated hook and no fish. That afternoon I had wanted nothing more than to catch a piranha. Until I caught one. And perhaps that’s the teachable MS lesson in all of this. Be careful what you wish for—it might not be everything you want. I know many of us with multiple sclerosis have been clamoring for years for an oral drug instead of medications that require a stick. And now an oral disease-modifying medication is available with more in the pipeline. But new drugs come with their own list of side effects (some potentially serious) and a treatment history that is shorter than a Mike Tyson fight circa the late 1980s. If injections or infusions are working for you, perhaps the best course of action is the status quo. For now, at least. After all, you never know when you’ll end up with a piranha at the end of your line. Originally published February 16th, 2011. Picture and caption added. Indiana Jones and I have a lot in common. We hate snakes. We often travel to exotic locales. 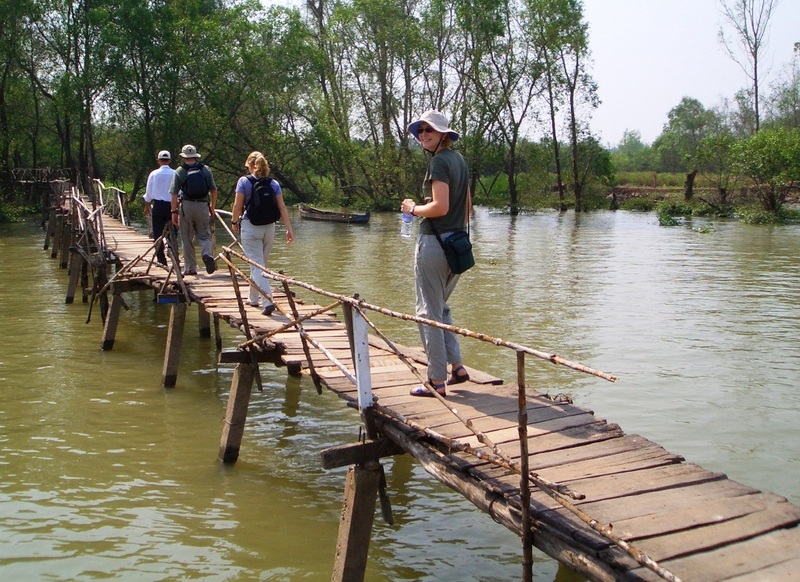 And we somehow get ourselves into sketchy situations that inevitably involve rickety wooden bridges and potentially calamitous falls. One would think I would avoid said bridges with my current walking challenges, namely balance requiring the use of forearm crutches. Yes, one would think. But when I’m out hiking, enjoying nature’s gifts of fresh air, summer wildflowers and cow-dung landmines, thinking is usually low on my list. After all, my brain is focused on checking out all the pretty blooms while avoiding poo with one of my four points of contact. But shutting off the cerebral cortex, I’ve come to realize when the gray matter is actually running, is not too bright. Anyway, a couple weekends ago I went up into the mountains to do a stretch of what was once one of my favorite hikes. I hadn’t been on the trail in years, but my sisters—one who is a physical therapist and the other a nurse—convinced me it would be a rollicking fun time. Besides, if I got into trouble I had an entire medical team at the ready. Although I admit midway through the 1.5-mile hike I was wishing my EMT buddy Gio was along as well as cadre of wilderness rescue experts, doctors, and a team of Sherpas to carry the mobile surgical hospital. The reason for my trepidation? Bridges. Specifically, bouncy wooden bridges the width of my shoulders traversing vast chasms where a single misstep would plunge me over a hundred centimeters into chilly mountain streams riddled with rocks and, I presume, the decaying corpses of previous failed attempts by others with multiple sclerosis. I didn’t remember the trail having this many bridges. Hell, I didn’t remember any bridges. And seriously, what does it take to install a simple handrail? 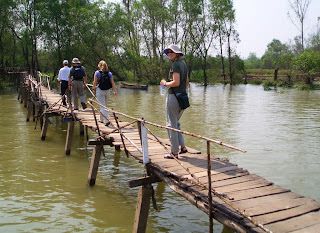 Even the bridges I crossed in the Mekong Delta had railings (granted unusable railings, as you can see, but still). Fortunately my PT sis Karen was right behind me on each bridge crossing, uttering words of encouragement while amplifying the bridge’s unpredictable bouncy reverb that comes when more than one person crosses at a time. If I were to fall, she was going to be right there, cheering me on to fall softly, because there was absolutely nothing she could have done if I had teetered. What was I thinking? Exactly. I was thinking about purple aster, Indian paintbrush, scarlet trumpet and… poop. Although each crossing had me tasting my left ventricle, I pressed on fully knowing it meant there would be another one exactly like it—this was an out-and-back hike. And I knew that fatigue would make the return infinitely more challenging. But as you can tell since you are reading this today, I survived. All seven bridge crossings were made successfully, some more than 30 feet long. And for you math majors out there who are concerned about the odd number (“Seven bridges, not eight, Dave?”), one crossing was over dried mud that I traversed through rather than over on the return as I neared the safety of our car’s first aid kit. While I wouldn’t necessary advise tramping over wobbly pieces of wood missing the occasional plank, I would advise going for it at times. Meet challenges—physical, mental, whatever they may be—head on. Heck, you have MS; you don’t have to live in a bubble like that poor kid David Vetter. Just be smart about it. In my case, I rested and cooled off before each challenging section of the trail to be as fresh as possible (that also tends to clear up my eyesight, which gets iffy with heat). That said, avoid taking unnecessarily stupid risks. You know, the kind that could get you killed. I’ve had to pass on adventures, like this crazy one in Bhutan, when I couldn’t justify the gamble. But if you do roll the dice, it sure doesn’t hurt to have family members in the medical field.